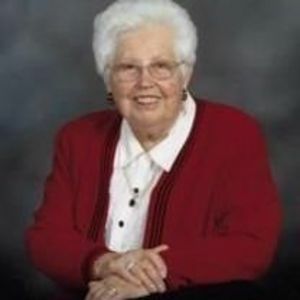 Marguerite Duke Bunn, 88, passed away peacefully after a long illness on November 29, 2017. There will be a viewing at First Baptist Church in Cary on Tuesday, December 5, 2017 from 12:45- 1:45 pm. The funeral service will follow at 1:45. Officiating will be Dr. Chris Haire. Burial will follow at the Old Zebulon Cemetery. Marguerite was born June 10, 1929 in Zebulon to the late Willie Mansfield Duke and Birtcha Mae Gay. She was the youngest of 5 siblings. She is preceded in death by John Claudie Duke, Ruth Gay Duke Stallings, and Billie Mansfield Duke. She is survived by her sister Ruby Mae Duke Newton, and 4 nieces and 4 nephews. They are John Claudie Duke Jr., Charles Wade Duke, Robert Lee Stallings, Eva Faye Duke Elmore, Shirley Jean Duke Price, Patricia Ann Newton Griner, Carol Ruth Stallings Ewing, Charles Bogan Newton, and one deceased nephew John Lester Newton Jr. She is also survived by many grand nieces and nephews. She graduated from Wakelon High School in 1948 in Zebulon and started working for the NC Department of Motor Vehicles. Starting with Key punching, she advanced to supervisor in the Accident Records Division. Marguerite was active in NC Public Safety Association and was instrumental in the "Click it or Ticket" program, working with Gov. Hunt. After working 44 years at the DMV, she retired. She also worked as a precinct official in the Wake County polls. She was a member and active in the First Baptist Church of Cary. She also enjoyed playing bridge, traveling throughout the United Sates, and visiting with her many friends including her longtime friend James Holland. Marguerite's caring manner, smiles, love, humor and helpfulness and fun loving attitude will be greatly missed by her family. Our comfort is that she has gone home to be with her Lord Jesus Christ. In lieu of flowerers, Memorial contributions may be made to the Bryan Alzheimer's Disease Research Center at Duke University Medical Center.